Showery conditions have ceased and windy conditions have dried up dewfall. As a consequence, bacterial leaf spotting disease has ceased affecting my Chinese celery, eggplant and Good King Henry. On the other hand, my West Indian gherkin have been obliterated by pumpkin beetle and my oriental greens have been heavily attacked by caterpillars and snails. Leeks, spring onions, sweetpotato and eschallots are growing well, but Madagascan beans are not being very effectively pollinated and many pods are blind. 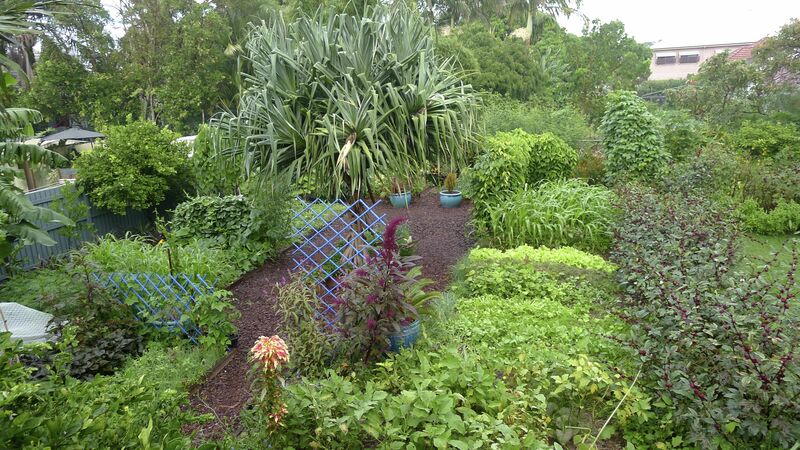 Ceylon spinach, cocoyam, jackfruit, and pawpaws are growing vigorously and yams are now ready for harvest. Cassava and citrus are looking magnificent. I’ve made 6 litres of Lemon & Lime marmalade (using a fifth of my crop), 6 litres of Kaffir Lime marmalade (almost all the crop), 3 litres of ‘Parramatta Sweets’ mandarin marmalade (one eighth of the estimated crop) and 6 litres of Rosella jam. The Rosella have all but finished cropping. Jerusalem artichoke ‘Dwarf Sunray’ has almost died down and is ready for harvest. Basil is close to finishing – Genovese, Thai and sacred basil are still cropping and my first mushrooms of the season are pinning. ← Why Do Bat Plants Have ‘Whiskers’? I’ve been making lime marmalade and rosella jam too but not one single mandarine this year probably due to our dry summer up here so we’re just using the final jar of last year’s Mandylade. Let me know if you’d like my Neverfail Bread Recipe to put all those preserves to good use. It’s amazing how you use every single spot of your garden – it must take a lot of planning and organisation.